The Hoya 58mm HRT Circular-Polarizer UV Filter is designed to block ultraviolet light and reduce the bluish cast of daylight while also helping to eliminate reflections and glare by filtering out light that has become polarized due to reflection from a non-metallic surface. The light from the sun naturally becomes partially polarized due to reflecting off electrons in air molecules, causing the light to scatter into what appears as haze. A filter with polarizing capability arranges, and filters, this directionally polarized light perpendicularly to the reflected light, allowing for the absorption of much of this light. This results in a noticeable reduction of glare and reflections from non-metallic surfaces and an increase in the saturation of skies and foliage. This filter is non-coated and offers approximately 98% average light transmission due to its High-Rate Transparency polarizing film. It is constructed from optical glass and precision milled aluminum frames. Blocks UV light and reduces bluish cast of daylight. High-Rate Transparency polarizing film helps provide approximately 98% average light transmission. 1.5 to 3x filter factor reduces exposure by 0.6 to 1.6 stops. 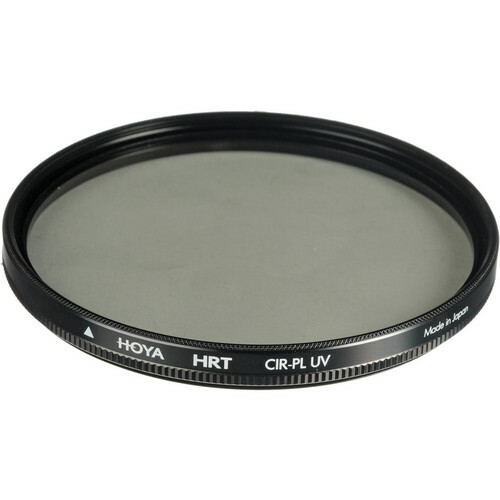 58mm HRT Circular-Polarizer UV Filter is rated 4.6 out of 5 by 26. Rated 5 out of 5 by Anonymous from Capture the image not the glare Works as advertised. Totaly removes glare from water to capture any object below the water serfice. I use this filter to capture images of fish,shells, and any other object below the serfice of water. It works well on reflections off hard surfaces such as automobles. I have not yet been succesful removing glare from glass. I believe that is the nature of any polarizing filter not just this one. Rated 5 out of 5 by Anonymous from Brightened up my day This filter replaces an existing polarizer which could not properly secure my lens cap. Besides providing a secure grip on the lens cap,the high quality glass improved sharpness and clarity while removing unwanted reflections. This is not my only Hoya filter. I highly recommend this product. Rated 5 out of 5 by Patrick M. from Hoya filters do the job! Hoya and B&W Schneider have become my fav filters, because I never have a problem with them. They are of high quality, clean well and easily, and take a beating (if necessary). The Hoya 58mm HRT polarizer does exactly what it is supposed to do. Cut glare/reflections and protect my Zeiss 35mm f2 lens (although I do install it over a UV or protection filter), with minimal exposure adjustment. Generally, I have found the Hoyas to be priced pretty well through B&H, and they do have a large selection. Rated 3 out of 5 by Mjbphotography from Not what I expected...But should've been The idea of allowing more light through the filter made me jump at ordering this Cir Pol filter but when I put it to use it's benefit was it's down fall. It's not a strong enough filter for the needs of what I bought it for. I was shooting a black car and was hoping for it to minimize the glare. In a perfect world it would remove it completely but I was expecting that. I would get in position and as I rotated the filter there was an obvious change, however it wasn't across the filter. At no point was there enough polarizing power across the horizon of the filter to take down the glare. I would get about a 20% removal to none at all then back up to the 20%. What I am left with is clean lines on the close side of the image and glare building up to the amount as if the filter wasn't even on. The KSM B&W for my 100mmL worked better but that's a long lens and I was wanting wide angles. So what's needing to happen now is an insane amount of post to correct this. It seems like a nice idea but if you want to polarize just buy the pro-1 or better yet the KSM from b&w. Oh, and for those of you who have never owned a circular filter before, DO NOT tighten the filter. It makes it nearly impossible to take off since the filter itself spins as you try to unscrew the filter off the lens. I have to be conscious about that every time I put this on. Rated 5 out of 5 by sacruser from Simply a great polarizer I use the polarizer primarily for landscape photos and was impressed by how much my photographs improved by simply adding a filter! Rated 5 out of 5 by Downtoearth from An excellent polarizing filter This is an excellent circular polarizing filter that will put some life into your pictures on sunny days! Can't go wrong with Hoya. Rated 5 out of 5 by Ron from Works great I was only looking for something to protect my lens from damage. B&H rep. gently steered me towards HOYA. Though I chose this one myself, I did have reservations because of the price. Also, I've never had a problem with returns or exchanges with B&H. Worth every penny! Colors are more vivid, sky is bluer, and water reflections disappear. Rated 5 out of 5 by Anonymous from Clear view! Amazing filter, mainly in contrastfull situations.